I was so excited when Doodlebug decided to create stamps of their collections! I love to stamp and color and being able to do this with Doodlebug critters and images.... heaven! As soon as I got the stamps, I opened them and got to work... who needs clean clothes and dinner... that can all wait! I made this cute little card using the Simply Spring Oh Boy and Flower Girl sets. How cute is that little bee from the Oh Boy Set??!! I added him to a background that I lightly inked along with a few clouds (the clouds are from the Lots O' Luck Rainbows and Unicorns set). I then made a little meadow of flowers using the individual flower stamps from the Flower Girl Set. I set them on some papers from the Simply Spring 6x6 pad. The hello sentiment is from the Oh Boy Set. Both sets include so many adorable images, my family may need to do their own laundry and cooking until I can get through them all! 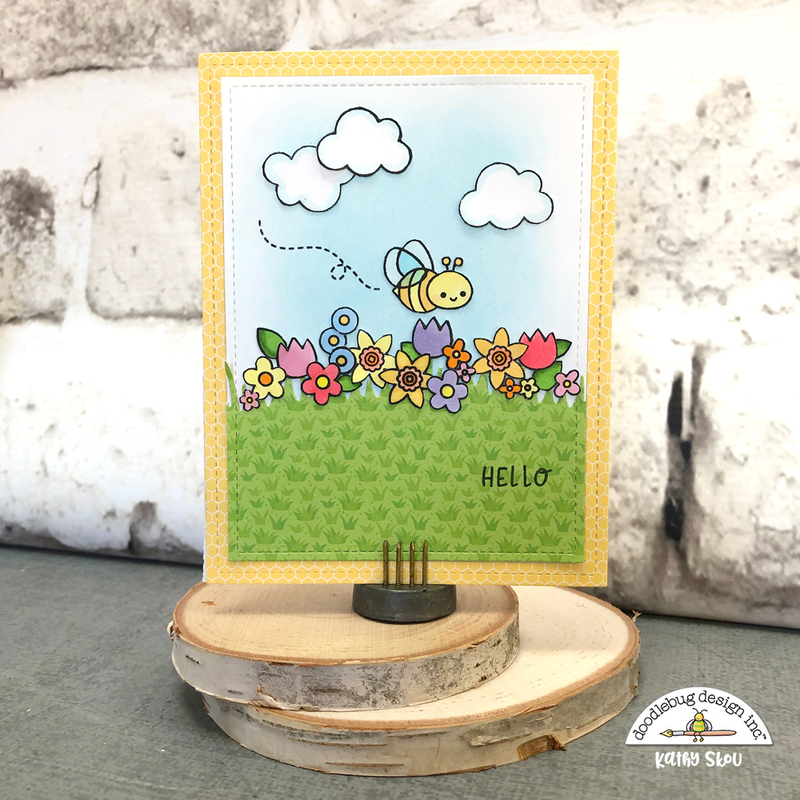 Have you used the new Doodlebug Stamp Sets in any projects? Make sure to post them and tag Doodlebug Design on Facebook and Instagram, we would love to see what you've made! That's it for me today, thanks for stopping by to peek! Such a delightful scene! Yay for Doodlebug stamps. Nice. Can I re-post this on my personal blog stampssale.com? Thanks.